Tell us by posting on the website if you have seen in your school grounds or local neighbourhood the bird that we are featuring that week. 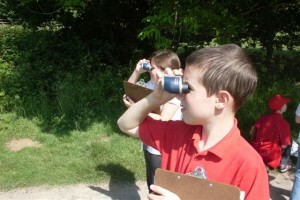 All bird sightings will be uploaded and displayed on our Bird Spotters Map! Please click on the "Bird of the Week" below, or see the bottom of this page for birds from previous weeks. Not everyone knows the name of every common garden bird. 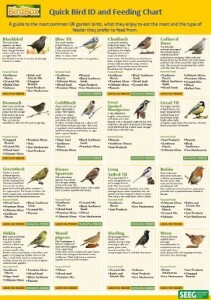 To help you recognise the birds that you see we have designed a Bird ID and Feeder Poster (PDF.) To download and print an A4 size copy just click on the thumb nail image of the poster. 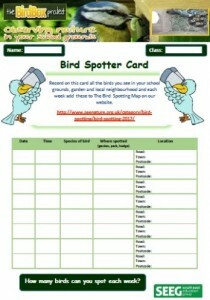 To help your pupils record all the birds they see in your school grounds and their gardens we have designed a Pupil Bird Spotter Card. To obtain your own copy just click on the image opposite. 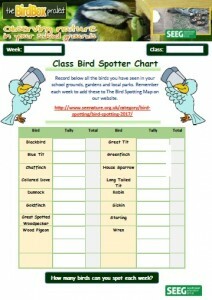 Why not each week keep a running total of the birds that your pupils have spotted that week before adding these to our Bird Spotters Map. To download a copy of the Class A4 Spotter Chart just click on the photo below.